I recently saw a dolphin and it inspired me to write about the common bottlenose dolphin. These beautiful animals grow to up to almost four metres long and can weigh up to 650 kg. Males are much larger than females. They are powerful swimmers and can reach speeds of up to 35 kph and jump very high into the air. I’ve seen a dolphin show and they are very acrobatic. Common bottlenose dolphins are very intelligent animals and their brains are larger than a human’s brain. They are very social animals, often living in pods of up to 100 dolphins. They use their intelligence to communicate with each other and help each other to catch fish. Because they are mammals, they have to come to the surface to breathe. For this reason, they can’t fall asleep or they would drown. 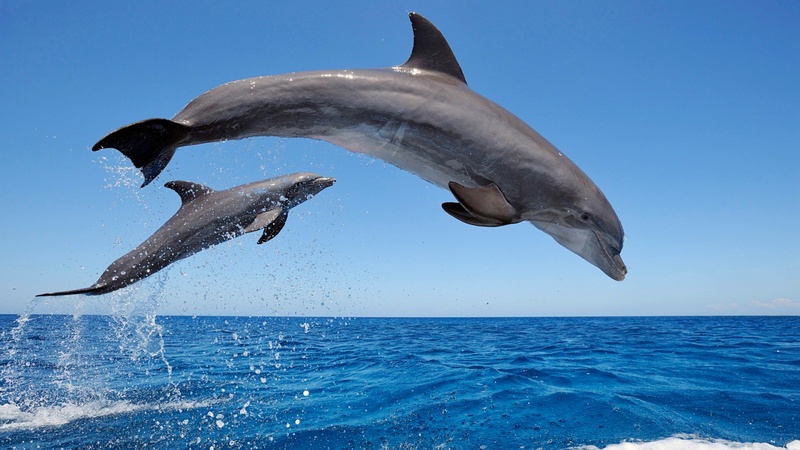 Common bottlenose dolphins are found in most tropical and temperate oceans around the world and are not in danger of extinction, although they are sometimes hunted by people. Are there any other interesting facts that you would like to share about common bottlenose dolphins? Great post! I love dolphins they are so cool! Hey Hayden! Cool post! I love Bottle nose dolphins! Have you ever seen the amazing story of Winter the bottle nose? She has an AMAZING story!